Buschbeck Bio Ethanol fireplaces, combine stunning contemporary design, eco-friendly functionality and quality German manufacturing. This is of course, in addition to the flexibility a bio ethanol fireplace provides in terms of positioning in a room. Unlike traditional indoor fireplaces, these eco-friendly pieces do not require a flue or a chimney and can be located centrally in a room and can indeed be moved if you need the space for a particular occasion or just because you feel like moving the furniture around. You see there are advantages to bio ethanol fireplaces that you didn’t even imagine! Fuelled by a renewable, green energy source once again the Boston and Crystal bio ethanol fireplaces prove than you don’t have to sacrifice design for ideals and social responsibility. The clean lines of the design is again reflected in both the energy source and the fact that there is no messy debris to clean up after you enjoy the beauty of the flames. The Both the Boston and the Crystal Bio Ethanol Fireplaces have a chamber which holds 1.5 liters of fuel and this will keep those flames dancing for around four hours. The Boston Bio Ethanol Fireplace is made from a combination of stainless steel, high grade powder coated carbon steel and safety glass which has been certified. The powder coated finish adds to the durability of the product ensuring that this beautifully designed piece remains flawless for many years to come. The design gives the impression that your fire is suspended mid-air, and from a distance it can give the impression that it is floating. The combination of glass (safety certified) and chrome accents, not to forget some stainless steel for good measure, combine to give a look that is modern and minimalist. 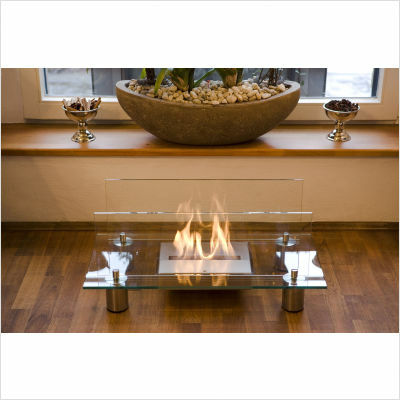 The Crystal Bio Ethanol Fireplace is suitable for city living or any modern, chic design scheme. As with all Buschbeck bio ethanol fireplaces in their Fire Dance series, The Crystal, incorporates their firebox which has apparently been credited as producing “the best flame display of any bio ethanol fireplace in the world.” Now to be honest with you, I have no idea who gave this accreditation, so I am not going to buy into it, but for me it is just a case that I think it looks good. Both of these modern, eco-friendly bio ethanol fireplaces, come complete with a safety lighting stick, flame adjustment tool and a funnel for pouring the fuel. So, how’s about a little Viva Home Interiors duel? Which of these bio ethanol fireplaces do you prefer? Will it be the Boston or the Crystal? Leave a comment below to tell me and if enough people do, I might just tell you which one is my favorite!